Multiple exposure HDR image created using Photomatix Pro taken from Hollywood Florida along the beach in Broward County. Situated between Fort Lauderdale and Miami is Hollywood, a classic Florida beachtown that’s enchanted visitors since the 1920s. 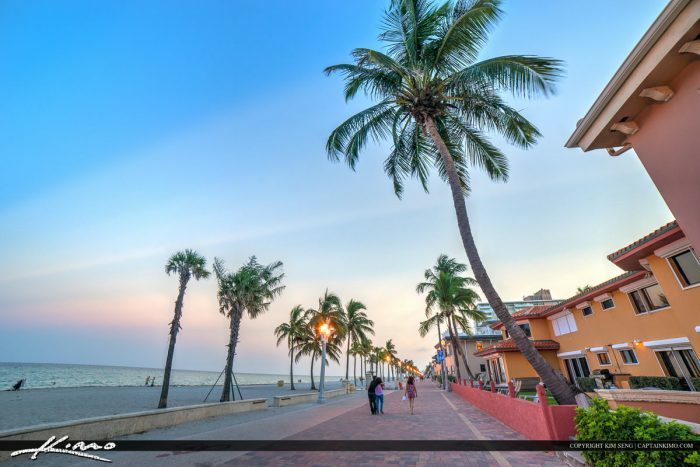 Named a Trip Advisor Traveler’s Choice Winner, Hollywood Beach features a one-of-a-kind oceanfront promenade called the Hollywood Beach Broadwalk that stretches nearly two and a half miles along the Atlantic. This brick-paved thoroughfare was named one of America’s Best Beach Boardwalks by Travel + Leisure magazine. The official boardwalk is 1.85 miles from Jefferson St. to Sheridian St., but can be continued north through Hollywood North Beach Park and then along N. Surf Rd. to Franklin St. for another mile. It is heaven for joggers, bicyclists, roller-bladers, and all who’d prefer to take in the action from the comfort of one of the countless eateries and cafés along the way. The path can get crowded on nice days. South end is off Jefferson St. North end is off Sheridian St.
Good acess is Hollywood Blvd. or Sheridian St.